Wild Vegas Casino bonuses for new players require a bonus code: WILDVEGAS. With this code, you can get a 350% match on your first deposit for an excellent first play experience. After the welcome bonus has been collected, you can continue to find more coupons, vouchers, no deposit codes by watching their promotions page and checking the daily deals. They also have VIP perks for frequent flyers who enjoy the games they have to offer. With bonuses for high rollers and reloads, you should be able to find some great deals for your playing sessions. This casino site works on a download basis, and doesn't offer instant play options or mobile apps for iPhone, iPad, or Android devices. It is a shame that this aspect is missing from Wild Vegas, and it may be that these options will be added in the future. Jackpot Grand is a comparable casino for Wild Vegas for bonuses and gaming options. Real Time Gaming produces the games which are used for each of these sites, and the number of bonuses available at each place are fairly even. On the other hand, Jackpot Grand has a better reputation for customer satisfaction than Wild Vegas, which frequently gives players problems when collecting winnings. US players are welcome at this online casino, and it is most popular in the USA. The site is available in English, as is the customer support. Players from all around the world are welcome here with the exception of a few countries, though it is important to read the rules and restrictions for specifics. Wild Vegas Casino bonuses are good for almost any of the games they offer. You can find table games, slots galore, video poker, and specialty games too. They are currently featuring a new slot game called Luck 8, which has been catching on in online casinos everywhere. They also offer popular options such as Aztec's Treasure, Food Fight, Goblin's Treasure, and Diamond Mine Deluxe. You can find a little of everything here, and plenty of new things to try as well. Many games offered here are progressive jackpots, and players enjoy trying them for the chance to win big with a little luck. The jackpot totals can climb into the millions, and it all depends on when you play. 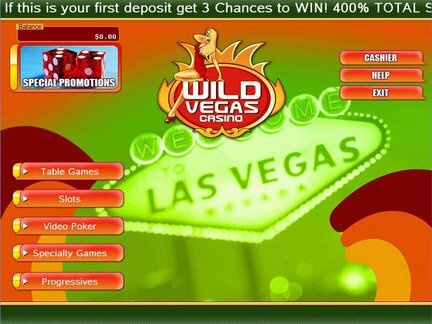 While many people win here at Wild Vegas, there are quite a number of complaints that winnings are voided out due to confusing terms and conditions. In order to see how high the jackpots have climbed, you have to download and play, which many previous players warn against. This casino has an unfortunately large number of complaints, many of which have gone completely unresolved. Not only have they been accused of purposefully slow and lengthy payout times, they also have been accused of unfairly voiding winnings altogether. Players who choose to put their money into this casino are advised to tread with care. This Real Time Gaming casino is run by Virtual Casino Group and licensed in Costa Rica. While the software that they use is great for games in many online casinos, this particular one doesn't have a history of customer satisfaction, and has been suspected for dealing unfairly with customers and their money. Wild Vegas Casino bonuses seem like a great opportunity, but the site was overall a disappointment. The color scheme was garish and the layout was difficult to navigate. To receive the bonuses you have to send bonus codes into the website, and they only offer play by downloading software. I doubt they will be developing mobile apps for iPhone, iPad, or Android apps anytime soon, or that many people would bother to download them. They do have games that offer free spins, which I successfully used. I didn't win anything substantial enough to give me problems withdrawing, but there are many reviews claiming that winnings were voided altogether with confusing rules cited. I rate this casino at a 2, and probably won't come back again any time soon. This casino has a lot of work to do in order to boost customer satisfaction and make the site more user friendly.